Blank Wall on Radio Shack Store Faces UniversityThis forces placement of merchandise racks and the checkout counter against the front wall of windows. 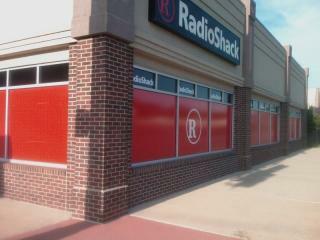 Accordingly, the numerous front and side storefront windows are plastered with opaque vinyl, and have been for some time. We see above that several years ago, the vinyl window stickers were at least populated with images of happy people using electronics. The new solid red is clearly designed to appeal to and attract drivers in cars on University motoring past at 40 miles per hour, a very suburban model for a relatively urban building. This type of signage design is probably more appropriate for "impulse" purchase places like Walgreens ("Oh, I need to pick up a stick of deodorant"). 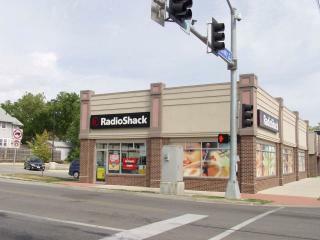 My sense is that Radio Shack is more of a destination retail for people who leave home already knowing they need a specialized battery, a replacement part, or some small electronic device. There is no need to catch the eye of a random driver because their shoppers are most likely already looking for the store. The underlying idea behind a retail storefront is to entice pedestrians to enter the store by displaying merchandise in an appealing setting. This must happen at a pedestrian level. Massive signage and logo branding happens at the transportation level, as a driver simply cannot perceive individual pieces of merchandise while in motion. A decision was made early on to orient the store backwards, towards the parking. This awkward pedestrian layout makes security more difficult. A break-in at night is much less likely to be observed since the back windows face the parking lot instead of the street. Since the same company owns all the parcels on this side of the block, it would be relatively easy to create a fully pedestrian edge from 41st to 42nd Street. For my money, that would include building additional retail space on the parking lot at the southeast corner of the block (Note to Uptown Partners LP: I'm willing to consult with you on the site plan). 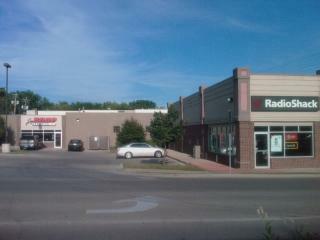 Fortunately, such a realignment would be easy on the internal layout of the Radio Shack as well. The entry door could be easily relocated to the corner, and at least two of the window bays re-opened, without much disturbance of the internal layout. As gas prices rise and urban residents in particular shift from driving on short errands to walking or biking, it will be come more important for retail stores to re-acknowledge the benefits of appealing to the pedestrian consumer. The four times I have been in the store have all been as a pedestrian - trip chaining from Godfather's Pizza next door or the Hy-Vee across the street. The first time I shopped there, I had to walk entirely around the building because I couldn't figure out where the entrance was!